Background and Objectives: Carica papaya leaves have been used in traditional medicine in Asian countries mainly in treating dengue. Various earlier studies proved their role in increasing platelet count in dengue patients. A precise mechanism of their action remains unknown. 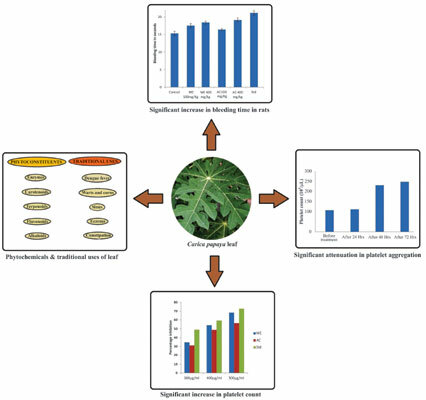 The present study aimed to evaluate the effect of C. papaya leaf extract on platelets and unravelling its possible mode of action. Materials and Methods: The methanol (MEA) and acetone (ACA) extracts were studied for antiplatelet activity and bleeding time in rats whereas the decoction of leaves powder was clinically used in patients with low platelet count. Results: The results showed that MEA, ACA and positive control (heparin) attenuated the platelets aggregation by 68%, 56% and 72%, respectively. On the other hand, MEA and ACA at 400 mg/kg significantly increased bleeding time in rats by 3 and 4 seconds, respectively, while the standard (aspirin) at 100 mg/kg increased the bleeding time by 7 seconds in comparison to the control. The clinical studies revealed that decoction of the leaf (1 g thrice a day) significantly increased the platelet count in the patients. Conclusion: The study concludes that the papaya leaf has potential to increase platelet count via attenuating their aggregation. Aedes aegypti, Carica papaya, Aspirin, Dengue, Platelet aggregation, Thrombocytopenia.